“Point of Light” picks up many threads from season one, as well as progressing the Tilly’s ghost, Red Angel and Spock plotlines. We reconnect with L’Rell and TyVoq’s man bun on Qo’noS, where holding onto the seat of power is proving difficult; Amanda seeks Michael and Pike’s help in decrypting Spock’s stolen medical files; and a new assassin is in town – Section 31 is real, and is recruiting! 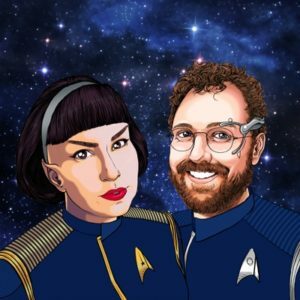 Team re:Discovery discuss overarching theories, question Sarek’s parenting, ask where (and who) is Sybok, and much much more. Connect with us and let us know your thoughts via Twitter, Facebook or our website. A transcript of this episode is available here. Season two continues as it began with more high adventure, as the Discovery fires up the spore drive and follows a new red burst 50,000 light years across the universe into the Beta Quadrant, where they find an impossible colony! As Pike, Burnham and Owosekun go down to the surface to investigate, Tilly ignores OH&S to help out Stamets and unearths her own spooky business. The mysteries multiply, the crew’s trust in each other grows, General Order One gets debated, and the #DetmerDrift is born. Plus there’s tension between science and religion, big questions about faith, and we want Pike to be our Dad (or Daddy?) more than ever. Connect with us via Twitter, Facebook or our website. A transcript of this episode is available. Episode Zero: Meet the Crew! Welcome the first episode of re:Discovery – a Star Trek: Discovery recapping podcast for people who don’t like recaps. Today we meet our hosts Carla Donnelly and Ben McKenzie and learn about their history of Star Trek and general sci-fi fandom – as well as what you, the listener, can expect from us with re:Discovery over the course of the show’s second season. Episodes will be released every Tuesday throughout Discovery season two.